Herbert Irving, who died in 2016 at the age of 99, was the vice-chairman of the Sysco Corporation, the world's largest distributor of food products. He turned down the chairmanship when he learned it would require a great deal of traveling as he wanted to spend more time with his wife, Florence, who died in 2018 at the age of 98. In 1968, they made their first substantial acquisition of Asian Art, a marble headrest, from Alice Boney in Tokyo who became their principal advisor. In 1994, the Metropolitan Museum of Art dedicated the Florence and Herbert Irving Galleries of the Arts of South and Southeast Asia. 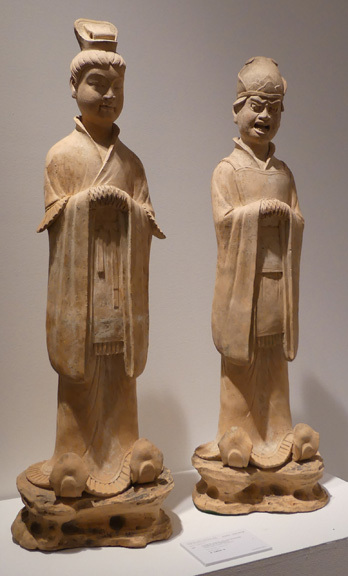 In 2004, the museum dedicated the Florence and Herbert Asian Wing and in 2015 the Irvings gave 1,300 objects to the museum. In 2017, Florence Irving gave $700 million to the Columbia-New York Presbyterian Hospital. In two catalogues, Sotheby's New York offered about 1,300 objects from the private collection of the Irvings. The evening action March 21, 2014 included only 26 items and all but one sold for $17,894,750 with only one lot failing to sell. Lot 1167 is a very attractive, anonymous pair of hanging screens from Japan in the 18th Century entitled "Blossoming Cherry Tress Beside A River Bank." Each screen measures 66 1/2 by 138 inches. The Irvings acquired the pair from Alica Boney in 1987. It has an estimate of $50,000 to $70,000. It sold for $175,000. 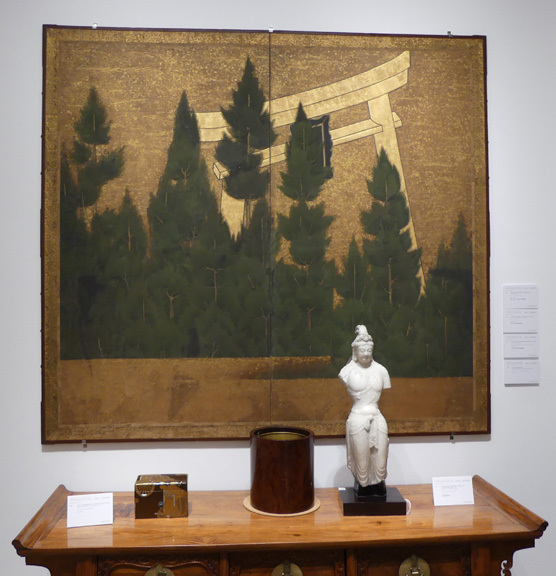 Lot 1168 is a very handsome anonymous Japanese 18th Century screen that measures 67 1/4 by 73 1/8 inches. It has an estimate of $6,000 to $8,000. It sold for $68.750. Lot 1166 is a lovely six-panel screen entitled "Flowers of the Four Seasons" by Ichikawa Kiyu (active 1852-1868). It measures 12 5/8 by 44 1/2 inches. It has an estimate of $6,000 to $8,000. It sold for $22,500. Lot 1107 is an impressive sandstone male deity figure from Khmer in the Angkor Periodk Angkor War style in the 12th Century. It is 28 inches high. 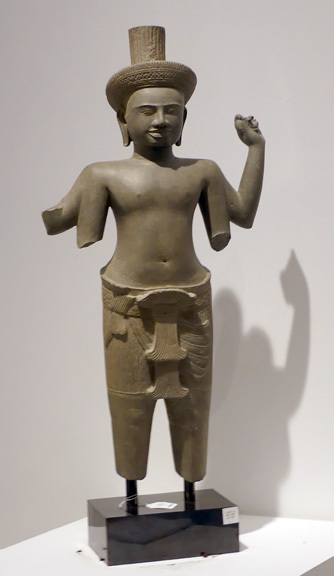 This figure dates from when the Khmer Empire was at territorial zenith. "This starts with the reign of Suryavarman II (r. 1113-1145), who ordered the construction of Angkor Wat, the largest temple of the Angkor period, dedicated to Vishnu. The last great king of the period, Jayavarman VII (r. 1181-1218), expanded into the territories of the Champa to the east. Jayavarman VII also adopted Mahayana Buddhism as the official state religion, replacing the cult of Vishnu which had predominated in the Khmer Empire for previous centuries. "Stylistically, the sculpture of the Angkor Wat period is marked by a return to the somewhat angular and upright modeling of the periods preceding the Baphuon style of the eleventh century. This angularity can be seen in the wide shoulders and hips of the upper torso, as well as in the drapery of the sampot, which sits roughly straight across the hips, and in the fish-tail folds which fall in heavy vertical pleats, in contrast to the earlier Baphuon period in which the drapery is full of curling flourishes. The size of sculpture from the Angkor Wat period, however, is generally in line with the more diminutive Baphuon-period works, in contrast to the monumental sculpture of the tenth century and earlier. "Many four-armed male figures from the Angkor Wat period depict the Hindu god Vishnu, unsurprisingly, given the religious beliefs of Suryavarman II. Towards the end of the twelfth century, images of Lokeshvara (Avalokiteshvara) and other Buddhist deities began to proliferate. Representations of Vishnu and Lokeshvara during this time are almost stylistically indistinguishable, save for their iconographic features. It is likely the artists of the later Angkor Wat period adopted the iconometry of Vishnu images when developing representations of Buddhist deities. 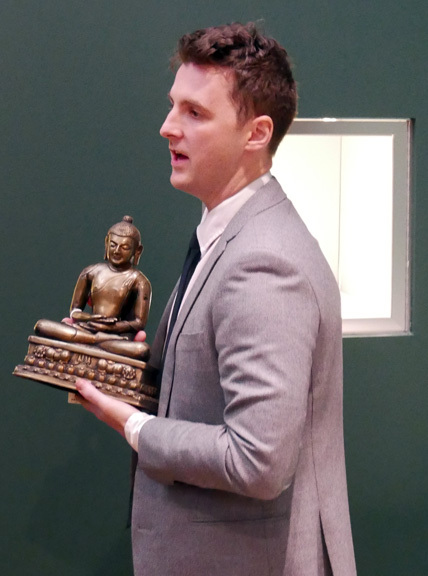 See, for example, a sandstone figure of Lokeshvara from the Robert Hatfield Ellsworth Collection, sold at Christie’s, New York, 17 March 2015, lot 36. The image can only be identified by the presence of the diminutive Amitabha effigy at the front of the chignon, as the other iconographic markers which would have been held in the four arms are missing. In the present figure, there is a small triangular, shaped loss in the same place that could once have been an Amitabha image. The only remaining iconographic identifier is the object held in the proper left upper hand, although it is not entirely legible. While it could be a fragmentary representation of the conch shell, an identifier of Vishnu, the horizontal striations on either end possibly indicate it could be a sutra manuscript, which is an attribute of Lokeshvara." The lot has an estimate of $100,000 to $150,000. It sold for $212,500. Lot 1108 is a sandstone figure of a female deity in the Khmer Baphuon style of the 17th Century. It is 28 1/4 inches high. The catalogue entry notes that the "tactile quality of the highly polished torso is suggestive of youthful skin and is sensitively offset against the refined treatment of the braided hair and pleated sampot." the lot has an estimate of $60,000 to $80,000. It sold for $93.750. 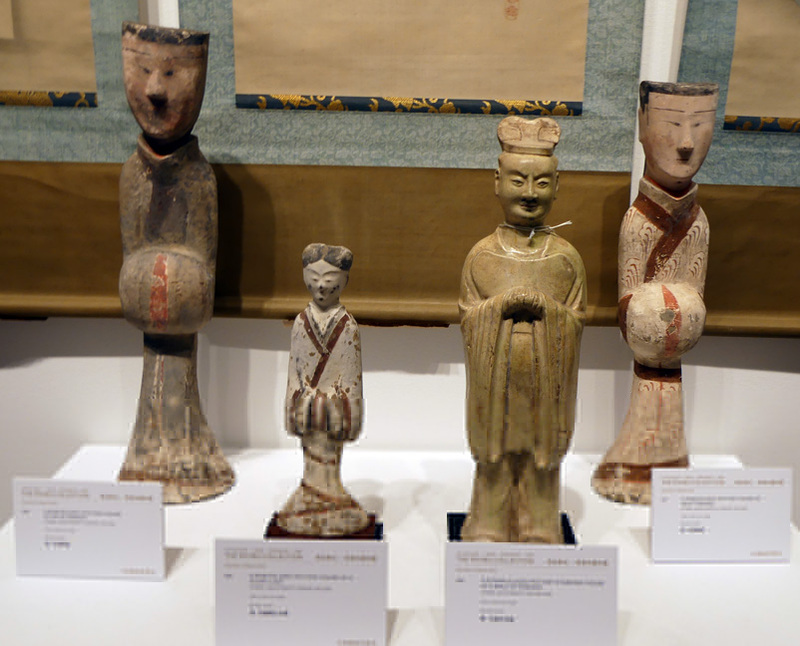 Lot 1228 is a handsome pait of Tang Dynasty attedant figures. They are 42 1/2 inches high and the Irvings acquired thm from Robert Ellsworth. They have an estimate of $30,000 to $50,000. They sold for $93,750. Lot 1226 is a painted stone figure of a court lady, Tang Dynasty. It is 14 1/2 inches high. It has an estimate of $80,000 to $120,000. It sold for $50,000. Lot 1222is a nice painted grey pottery figure of a court lady from the Han Dynasty. It is 12 3/4 inches high and was bought by the Irvings from Ralph M. Chait Galleries in 1983, It has an estimate of $2,000 to $4,000. It sold for $1,500. 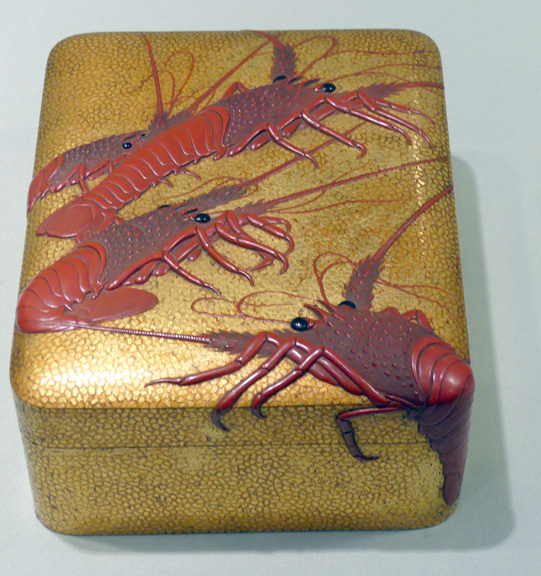 Lot 1149 is a very nice lacquer tebako of crayfish that is 6 inches long and is dated Meiji Period, late 19th Century. It has an estimate of $8,000 to $12,000. It sold for $23,750. Lot 1102 is a nice buddha figure of silver and copper inlaid bronze from Western Tibet in the 11th-12th Century. It 12 1/4 inches high and was once owned by Christian Humann and then Robert Ellsworth. It has an estimate of $100,000 to $150,000. It sold for $495,000.